Regenerative managed grazing by local grass farmers might be one part of the solution to our climate change woes . Since she moved to California in 2013, Ariel Greenwood has regularly played tour guide to visitors from other parts of the country, showing off the natural wonders of Sonoma County. She doesn’t mind, but the North Carolina native yearns for the day when her guests are as excited about checking out thriving bunch grasses as they are about touring the Redwoods. The health and vitality of the grasslands at Pepperwood Preserve, a conservation-focused nonprofit high in the hills above Santa Rosa, is a passion of Greenwood‘s. Colloquially known as “The Herdess,” the 26-year-old lives on the 3200-acre preserve where she manages a 163-head herd of cattle. She works for Holistic Ag, a managed grazing operation started in 2012 by documentary filmmaker and media professional Aaron Lucich, with the support of an anonymous silent partner who purchased an initial 40 cattle and provides financial back-up for the operation. On a recent Monday afternoon at Pepperwood Preserve, the temperature hovers near 100 degrees and the skies are blue and clear. A hot wind blows through a stand of tall trees where we seek shelter from the blazing sun. Beyond the ridge, where we hunker down, stretches a broad, brittle grassland, dried to a late summer crisp and dotted with coyote bush, native grasses, and clumps of oaks in the distance. The Chalk Hill Winery appellation—an unnatural emerald in contrast to the natural golden-browns—snakes through the foothills below. Grasslands cover about 40 percent of the U.S. and are our “most degraded and most misunderstood” biome, writes Richard Manning in Grassland: The History Biology, Politics, and Promise of the American Prairie. Concern for this degradation resonates deep in Greenwood’s core. She points across the valley at a vineyard topping a hillside to the north. The land below, as it descends towards a creek, is grey and appears bare. Greenwood worries about the silt and runoff, which might be entering the Russian River watershed. She points out the few cattle grazing on the outskirts of the vineyard. Greenwood isn‘t alone in her sentiment. 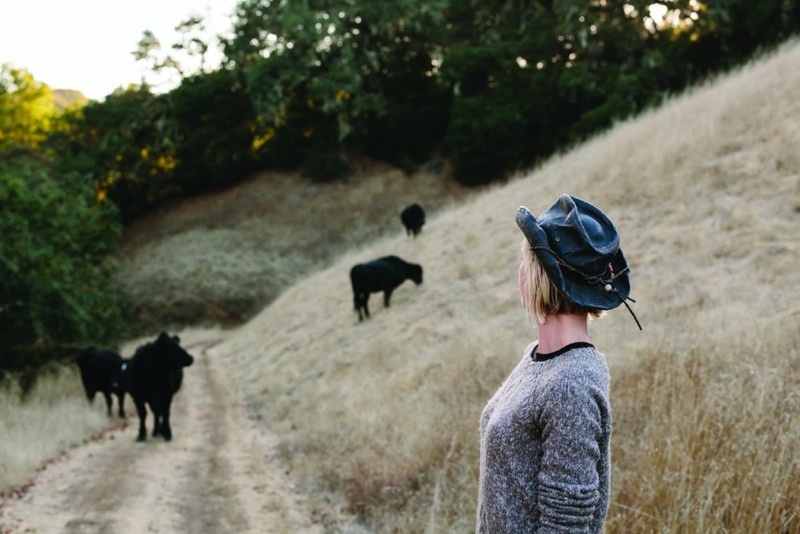 In fact, she’s part of a growing movement of operators in Sonoma County who believe that managed, intensive, rotational grazing holds a key to solving our coming climate change challenges. Also known as regenerative grazing or holistic planned grazing, the movement has gained shape over the last ten years. The original players, now mentors, include Guido Frosini at True Grass Farms in Valley Ford and Stemple Creek Ranch in Marin County. The Marin Carbon Project is also credited as a catalyst for the movement. Over the last five years, a wave of new grass farmers, as they are sometimes called, have entered the scene. Marie Hoff of Capella Grazing grazes, breeds, harvests wool, and manages a growing flock of Ouessant sheep at Chanslor Ranch in Bodega Bay. Other players include Byron Palmer and Nate Chisholm at Sonoma Mountain Institute and Grounded Land and Livestock, Aaron Gilliam at Sweetgrass Grazing, and Aaron Lucich and his apprentice Ariel Greenwood of Holistic Ag. While each operator takes a slightly different approach to the business aspects of the endeavor, all share a common goal: To take into consideration not just the animal’s health but the ecosystem in which the grazing is done (soil, land, water, grasses) and the health of everyone involved. Savory came to the conclusion that herbivores like cattle, sheep, bison, and goats exist in a reciprocal relationship with grassland, soil, and watersheds. He argued that in a brittle environment, where rain only falls for half the year (like Sonoma County), standing dry material is the norm. Without moisture to break down the grass and other vegetative materials, mechanical action, what you get from the hooves and mouths of large herbivores, is required. Savory looked back to prehistoric times. He saw patterns in the interactions between extinct megafauna—mammoths, mastodons, giant sloths, bison—and grassland and savannah ecosystems. They moved in large herds, grazed, pooped, urinated, got chased by predators into other areas, resumed grazing and the cycle started all over again. This kept overgrazing to a minimum and ensured that grassland received the periods of disturbance and rest needed for productivity, reproduction, detritus management, and seed regeneration. Savory went on to establish Holistic Management International and the Savory Institute to spread the word about high-density, frequent rotation grazing as a key to the health of soil and native perennial grasses. Both offer certification and workshops on holistic management and holistic managed grazing. Aaron Lucich, the founder of Holistic Ag, initially encountered Savory while filming a documentary about climate change and agriculture. As the father of two young children, Lucich was desperate to figure out how to steward land and stop the “runaway train” of climate change. He settled on holistic managed grazing as the solution, going so far as to say that we need to clear out conventional livestock agriculture completely and return to a system that’s more symbiotic and mimicking of nature. The meat produced out of such as system is the meat that is available to eat. No more, no less. Four years ago, Aaron Gilliam started Sweetgrass Grazing. Currently, he rents sheep on a seasonal basis from sheep farmers Robert and Jamie Irwin, the owners of Kaos Sheep Outfit in Lake County. “Without them, both their mentorship and the flock I rented, I would just be a talking head with no operation to show for it,” he says. He still works his day job as a butcher at Thistle Meats in Petaluma. It works like this: Gilliam signs a contract with interested parties who want to try managed grazing on their land, rents the sheep, gathers the electrical fencing and other equipment, and starts the grazing process. Right now, he’s a team of one with a part-time contractor assisting when needed. Eventually, he’d like to build up to a six-person operation on 1,500 acres. In addition, he does year-round management of a flock owned by Monkey Ranch Farms on 50 acres in Petaluma. Each day, he moves the sheep, depending on how much grazing is needed, to a new location using electrical fencing to keep them contained. Throughout the year, he assesses the various needs of the property: Are the perennial native grasses thriving? Is the soil healthy? Has six-inch grass become six-foot grass? Are trees and shrubs establishing and surviving? What areas need to rest so that grasses can replenish? At the same time, Gilliam considers the needs of the animals: nutritional requirements, breeding schedules, etc. It’s about balancing the requirements for healthy animals with the requirements for healthy land. As you can imagine, managing all this information could easily become overwhelming. Gilliam uses apps to keep it all straight: Ranch Manager for the health and genealogy of the herd, Pasture Map to map how the animals are moving, and iNaturalist to document the biodiversity of the landscape. Yes, intuition plays a role, but technology simplifies everything. Ultimately, he wants to use managed grazing to create conditions in which savannah landscape prevails. Somewhere between a forest and an open grassland, savannahs contain an astounding diversity of grasses, trees, shrubs, natives, and other species. A more biodiverse habitat means more food for humans and animals. That’s a good thing. But historically, the savannahs in Sonoma County are an endangered species. Gilliam attributes this to years of mismanagement. For Gilliam and other grassland managers, the goal is to get back to where we were 300 years ago, when rich alluvial soil was abundant and native perennial grasses, their roots stretching 20 feet underground like carbon sequestration maniacs, kept the hillsides green for up to ten months out of the year. Byron Palmer, a regenerative grazing specialist with the Sonoma Mountain Institute, wanted to work with managed herbivores for this very reason. He became interested in ecology and restoration in his 20s. 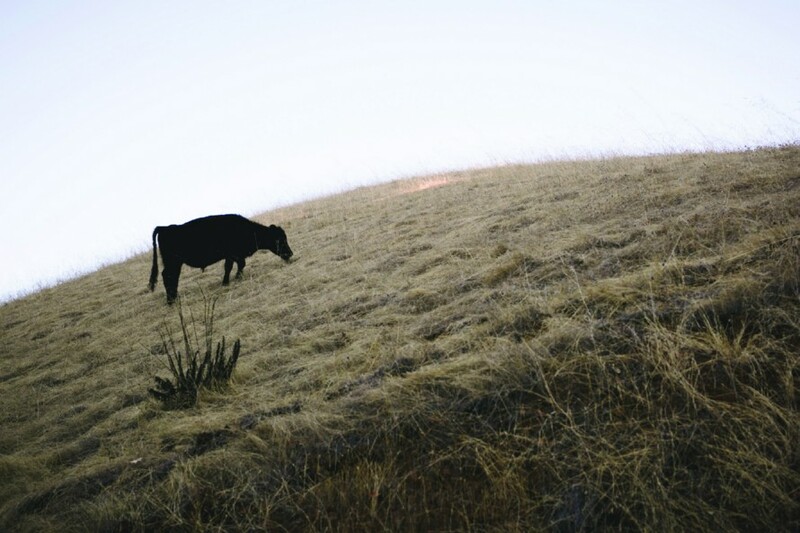 After seeing a presentation by the Marin Carbon Project, the former vegetarian came to the conclusion that cattle—managed and ecologically grazed cattle—were the best tool out there for restoring the biodiversity and ecological health of a landscape. In 2013, he partnered with Nate Chisholm, who was implementing Savory-inspired grazing practices on 100 acres for Sonoma Mountain Institute. In addition to their work with Sonoma Mountain Institute, Chisholm and Palmer own a private enterprise, Grounded Land and Livestock. Between the nonprofit and private company, they graze on seven properties for a total of 3,200 acres, offering custom animal care and grazing to local and national dairies and beef suppliers that have cattle and need a place to put them. “Everybody needs grass, and we’ve got grass,“ Palmer says. “We’re essentially managing the biology, carbon, plants, and water by managing the animals, the grass, and the top inch-and-a-half of soil,” says Palmer. So far, the results look promising. On just one property, rangeland experts and soil scientists have measured a 148 percent relative increase in native species and a 126 percent relative increase in overall species. Back at Pepperwood Preserve, Systems Ecologist Celeste Dodge says that the nonprofit has enjoyed a mutually beneficial relationship with Holistic Ag. Pepperwood Preserve gets the benefit of increased grassland and watershed health, and Lucich and Greenwood receive free access to high-quality forage and can sell the grass-finished beef for profit through their private businesses. Time can only tell whether conservation grazing, as they call it at Pepperwood Preserve, actually results in large-scale measurable changes. Soil carbon, for example, can take years to significantly increase. Anecdotally, Dodge says they’ve already seen results they like. One example: an increase in native purple needle grass at different monitoring sites. For now, says Ariel Greenwood, without a willingness from local landowners and land-holding institutions to see the value in managed grazing rather than weed-whacking, chemical inputs, and mowing, the movement will have a tough time growing—even if the data shows it is working.